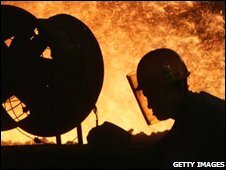 Britain's biggest union, Unite, is merging with the US-based United Steelworkers union (USW) to create a new "global" union. The two unions will create a new body called Workers Uniting. Unite was formed last year in a merger between two of the UK's biggest union - the Transport and General Workers Union and Amicus. The aim is for the new group, with some three million members, to synchronise pay talks with multinational companies. The merger will be finalised when the deal is signed in Las Vegas later. Derek Simpson, joint general secretary of Unite, said the move was an inevitable response to the globalisation of business. The union said that it was concerned about deteriorating pay and conditions for workers in Europe and the US, and would look to tackle an increase in the "casualisation" of employment. "The political and economic power of multinational companies is formidable," he said. "They are able to play one nation's workers off against another to maximise profits. With this agreement we can finally begin the process of closing that gap," he said. Mr Simpson also urged other unions, from Poland to Australia, to join Workers Uniting. The president of USW, Leo W Gerard, said that the merger was needed to counter "the growing power of global capital". "Globalisation has given financiers licence to exploit workers in developing countries at the expense of our members in the developed world," he said. "Only global solidarity among workers can overcome this sort of global exploitation wherever it occurs."